The average age of men in the Civil War was 25.8 years; World War I was 24; World War II was 26; Vietnam was 22; and the average age in the US military today is 29. War is young men’s work, but King David was still fighting giants thirty years after Goliath. He took on another Philistine giant named Isbi-Benob. This time the results were quite different. David was not able to take him down and nearly lost his life trying (2 Samuel 21:15–17). Abishai stepped in and rescued David. The Israeli army told David to fight no more, making this David’s last battle. What lessons do we learn from this old warrior? David was still fighting giants. How impressive that this king—full of honors, trophies, riches, and successes—was still in the battle. He had wives, children, responsibilities, and people counting on him, but he was still fighting the good fight. The Christian life is a fight to the finish. It has no retirement plan this side of heaven. God said that the righteous “shall still bear fruit in old age; they shall be fresh and flourishing” (Psalm 92:12–14). Commodore Cornelius Vanderbilt, between the ages of 70–83 (1864–1877), added 100 million dollars to his fortune. Alfred Lord Tennyson, at 83 (his last year), wrote “Crossing the Bar” (1892). Giuseppe Verdi wrote “Ave Maria” at 85 (1898). Cato the Elder (234–149 bc) began studying Greek at 80. When asked why he began such a difficult language at that advanced age, he stated it was because he had waited too long to start any younger. Noah lived six hundred years before God called him (Genesis 6). Abraham and Sarah were almost a century old when Isaac was born (Genesis 21). Jacob saw old age as a time to help others (Genesis 47:10). Until his dying day, he stayed in the saddle. He died worshipping God and blessing his family (Hebrews 11:21). Caleb was 85 when he requested the difficult task of driving giants off a mountain (Joshua 14:6–12). Solomon wrote, “The glory of young men is their strength, and the splendor of old men is their gray head” (Proverbs 20:29). “The silver-haired head is a crown of glory, if it is found in the way of righteousness” (Proverbs 16:31). Wisdom is gathered over many years (Job 32:7). In youth, we wonder; in old age, we know. Experience teaches that God’s word is to be trusted: “I have been young, and now am old; yet I have not seen the righteous forsaken, nor his descendants begging bread” (Psalm 37:25). As circumstances change, we find other ways to be of service. A study of 400 outstanding achievers found that people between the ages of 60 and 70 produced 35 percent of the world’s great achievements and people between 70 and 80 produced 23 percent. This means that 54 percent of the world’s great achievements were accomplished by people over 60. We must plow to the end of the row and never look back (Luke 9:62), for “now our salvation is nearer than when we first believed” (Romans 13:11). When David’s men saw that he had almost been killed, they made him promise not to engage in battle anymore, lest he should “quench the lamp of Israel” (2 Samuel 21:17). They had previously made this request (18:1–4). David was not the mighty warrior he once was. They could do without David as a soldier, but they did not wish to continue without his leadership. His role needed to change. From full strength to limited strength. The physical man waxes old with time (2 Corinthians 4:16–18), as the sand leaving an hourglass. Yet he gets better with age. You may not be able to do all that you used to, but you can do much that you did not know to do then. “She has done what she could” (Mark 14:8) is the right formula for pleasing the Lord. Younger Christians need the power of your positive example. They know you often attend services when you do not feel like it, for instance. It encourages them to come (Matthew 5:14–16). Age takes its toll. When Mickey Mantle was 61, he was approached by a middle-aged man and his boy for an autograph. The man had tears in his eyes when he said, “Son, it took me thirty years to get here to shake this man’s hand. This is the greatest baseball player who ever lived.” The little boy looked at Mantle, then turned back to his dad and said, “Daddy, that’s an old man.” We cannot stop the aging process, but we can keep ourselves useful. Our roles change in the church. Sheep sometimes become shepherds. Shepherds go back to being sheep. A student becomes a teacher, and a teacher goes back to being a student. A deacon becomes elder; a preacher becomes a hearer. There may come a time when our role in the church must change, even against our desires. It may come when we get older and are unable to accomplish physically what we once could (cf. Genesis 48:10; Ecclesiastes 12:3–7; Psalm 71:9). This does not mean we cease to work or cease to be of value to the church (Job 5:26; 12:12; Proverbs 16:31; Psalm 92:12–15; 1 Kings 12:6–8; Joshua 24:15). It means we change how we work. There may come a day when all we can do is pray—but that is a lot! (James 5:16). Whatever we do, we should do it heartily unto the Lord and not unto men (Colossians 3:23). Whether it is from behind the scenes to on stage or from limelight to unnoticed makes no difference. Wherever God needs us to serve, we are willing to seek His glory. Bezaleel and Aholiab were the primary craftsmen responsible for the tabernacle in the Old Testament (Exodus 35:20–24). Behind the scenes, though, many unnamed people contributed in important ways (women, for instance, 35:25). God certainly smiles on those who work behind the scenes. During WWII Great Britain needed to increase coal production. Winston Churchill called labor leaders together to ask for their support. He had them picture a great parade through the streets of London at the end of the war. First would come the sailors who had safely kept the sea lanes open. Then would come the soldiers who had safely returned from Dunkirk and who eventually went on to defeat Rommel. Then would come the pilots who had driven off the German air force. Maybe your role is to be in the limelight and leadership. If so, stay humble, work hard, and bring God glory. Maybe your role is to “keep your face in the coal” or be a nameless seamstress. If so, do your best and bring God glory (1 Corinthians 10:31). The most powerful enemies are often reserved for the last conflict. David made his reputation with the defeat of one giant, but he concludes it with the conquest of four. David did not coast out—he was still taking on great challenges near the end. From David’s example, we can learn several lessons. First, we must continue to take on challenges throughout life. In the self-assurance of youth, we may courageously take on all comers. In the timidity of age, we may think the greater value is in choosing our battles carefully and living to fight another day. To be sure, wisdom can be the better part of valor, but we must not shy away from a fight that needs a warrior. Christ has a place for experienced, battle-tested soldiers who can defeat enemies that that might overwhelm new recruits. Second, David’s first experience in the field of battle was a giant; so, his last was against giants. It is the same in our spiritual warfare (Ephesians 6:13–18). From our baptism until our coffin, we battle the great enemy of mankind, Satan (1 Peter 5:8). Paul wrote, “In all these things we are more than conquerors through Him who loved us” (Romans 8:37). Third, death is a Christian’s last “son of Anak” (1 Corinthians 15:26). He is a relentless, unstoppable, unbeatable enemy. Death pursues us. From the moment of birth, we start to die. For the first two or three decades of life, however, we never notice. We may attend a grandparent’s funeral or hear a sermon on the brevity of life (Psalm 90:10–12), but we make no personal connection to ourselves. We are growing and gaining—each year getting stronger, smarter, and more physically attractive. We are developing competence in job skills and social confidence. Usually, sometime in our third or fourth decade, we get a first glimpse of the enemy pursuing us. He is not as far back nor as well hidden as before. This revelation may come at the loss of a long-time friend in a car accident or a person younger than we are who succumbs to cancer. We may spend time in a hospital ourselves for the first time or have a frightening brush with death. The person reflected in the mirror has some before unnoticed grey hairs or lines around the mouth and eyes. In our seventh or eighth decade, usually, death will eventually deal us a harsh blow (unless Jesus comes), but we are confident in final victory—we will pass through death on to the resurrection of glory (1 Corinthians 15:54–58; John 5:28–29). Death cannot separate us from Christ’s love. Death just takes Christians home (2 Corinthians 5:8; Philippians 1:23–24; 2 Timothy 4:6–8). Paul writes of the death of death in 1 Corinthians 15. How was death disarmed? How was its stinger removed? (1 Corinthians 15:57). Christ defeated death in His resurrection. The only real weapon death holds is a valid accusation of unforgiven sin. This is why many people are scared to die. It is not the unknown they fear; it is the known. During this period between Christ’s resurrection and ours, death is disarmed but not yet destroyed. We need not fear death now any more than the allied soldiers needed to fear Hitler’s defeated army in the weeks after V-E Day (May 8, 1945) but before the Paris Peace Conference officially ended hostilities on February 10, 1947, or any more than Americans needed fear the English after the Revolution. It took three months after the British raised the white flag for their ships to leave New York harbor (November 25, 1783). Disarmament guaranteed victory, but it was delayed in each case. 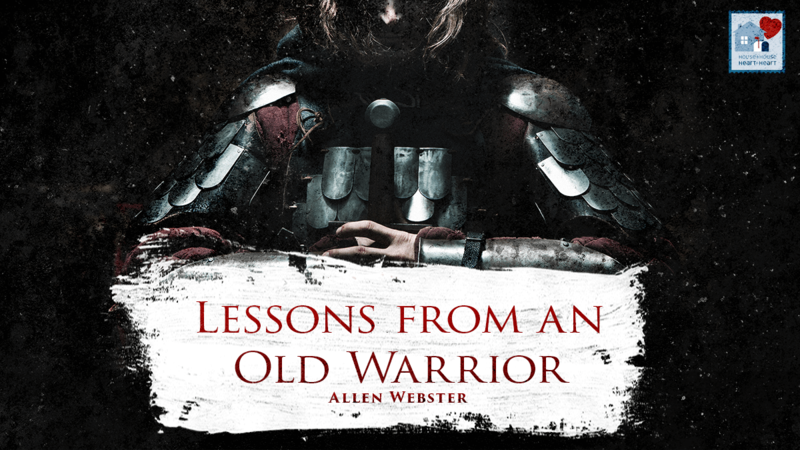 There is much to learn from David as an old warrior. Keep fighting. Victory is assured.